A common feature of bend dies; a pair of tabs extending circumferentially from the top and bottom surface of the die which interlock with mating shoulders on the clamp and pressure dies. The purpose of interlock is to help hold the clamp and pressure dies in the plane of bend, especially on older machines. 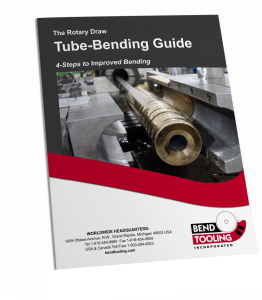 Occasionally the bend die will have the shoulders and the clamp and pressure dies the tabs; this is called “reverse interlock”.